Rapid Solicitors Kawasaki rider Shane ‘Shakey’ Byrne made up for the first race crash by pushing to victory in the second outing, ahead of Tyco Suzuki’s Josh Brookes and Samsung Honda’s Alex Lowes. Doodson Motorsport Honda rider Robin Harms failed to make the start of race two, given that his CBR1000rr was too badly damaged, following his off at Cascades in race one. 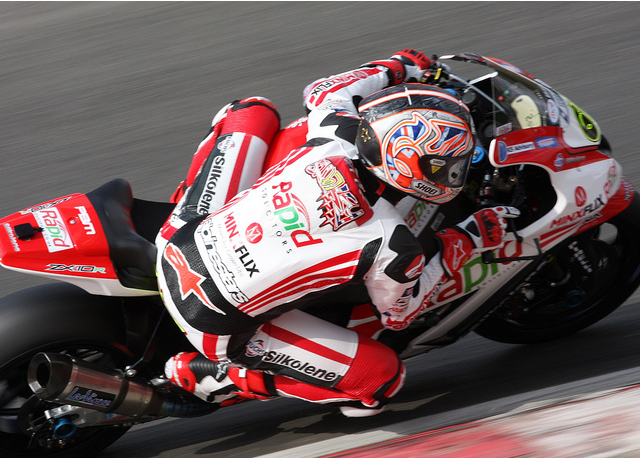 Byrne got the hole short ahead of Brookes and Ellison and Lowes. Coming out of the first turn, a collision between GBMoto’s Peter Hickman and Buildbase BMW rider Jon Kirkham left Hickman on the floor, with his Honda collecting Kirkham’s team mate, James Westmoreland. Both riders walked away unhurt. By the end of lap one, Lowes had managed to pass Ellison for third. The spotlight was once again on Ryuichi Kiyonari as he started race two from 19th on the grid, he managed to salvage 12th, a slight improvement on his race one result. After technical problems throughout practice and qualifying it looked like James Ellison’s woes were over, after a podium in the first race. However, another terminal issue with his Yamaha R1 saw him out of the race on lap 16. He wasn’t the only one with technical issues, as American PJ Jacobson retired on lap 8, Karl Harris on lap four, and the disappointing weekend continued for Michael Rutter, who departed on lap 11. Kirkham and Tommy Bridewell, still riding with a hole in his leg, once again battled it out for 4th position, with Kirkham finishing ahead of the West Country rider. Quattro Plant Kawasaki’s Chris Walker finished in a lonely 6th place, whilst Howie Mainwaring finished in 7th, pipping fellow Kawasaki rider Keith Farmer to the line; securing MH Kawasaki’s best result of their debut year. Matteo Baiocco finished 14th, taking Rapido Sport Racing’s first points of the year on the Ducati Panigale. Towards the end of the race, Brookes and Lowes were on the back of Byrne’s Kawasaki, however a mistake from Brookes on the penultimate lap widened the gap to Byrne, too far out of reach for either Brookes or Lowes. On the final lap, Brookes and Lowes had a game of cat and mouse as the two fought hard for second and third place, with Brookes having a slight error but keeping second place firmly in his grasp. Lowes has maintained his championship lead but only by a mere one point from Byrne who is still followed by Brookes and Ellison.